On Sale £39.95 - all incl (No hidden extras). Got an old or hard to replace water filter? Get an upgraded new housing unit here. 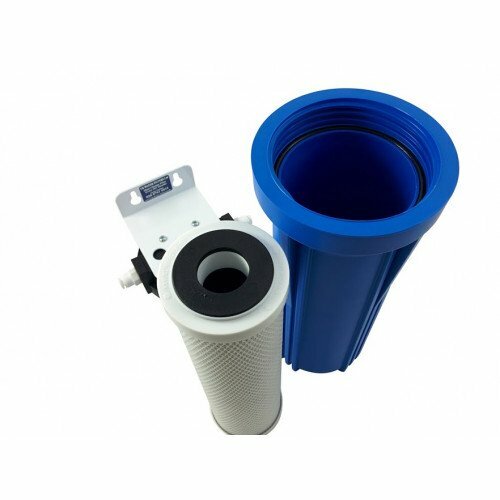 You can replace almost any water filter system with this well made, high-quality unit. Gives you beautiful, fresh-tasting, filtered water, on tap 24/7. Very easy to fit - will take you minutes (more details below). 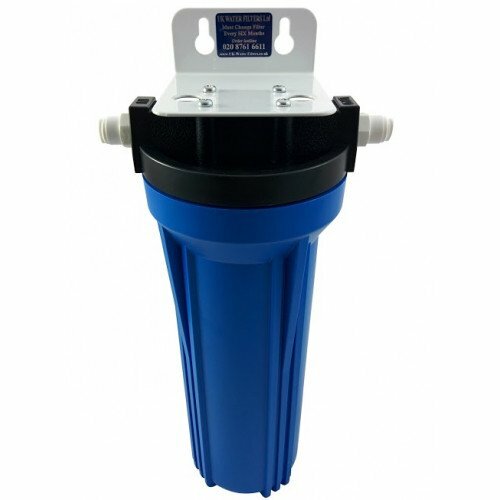 Join the many customers who've replaced their existing water filters while keeping their existing tap and connection to their water supply. Economical - a replacement cartridge costs £13.95 and lasts 6 months. Save ££s on bottled water - plus it's healthier. Guaranteed for 3 years - Buy with confidence. If there are any problems we'll replace it for you. 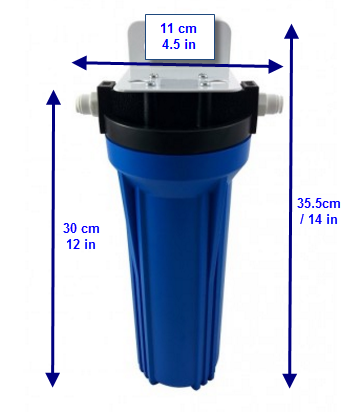 This 10 inch housing unit will safely replace almost any make of water filter. It includes our best selling "Master Purifier" water filter cartridge. Its excellent performance brings you the best purification in its class. And it gives you great value - as you'll see if you compare it to other makes. Plus, no more problems with getting replacements. 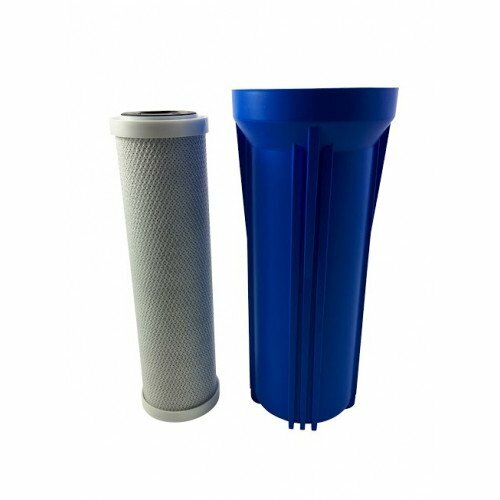 This is because the filters are the standard 10 inch size which are the most common in the water filter business. 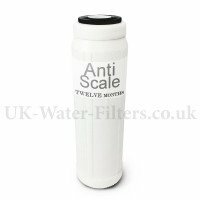 They are easily available from any water filter supplier. So, even if we disappear - and we're certainly not going anywhere soon - you'll be able to source new suppliers easily. Many water filter companies try to be clever by making sure their cartridges are a unique shape and size - which only they can sell. That might be reasonable if they can ensure that replacement cartridges are easy to get hold of. But often they aren't. Or the replacements are so expensive that people understandably look for alternatives. With this solution, you will never again be stuck with a cartridge that's hard to replace. 3 Year warranty. Buy with confidence. We'll quickly replace anything that's broken. 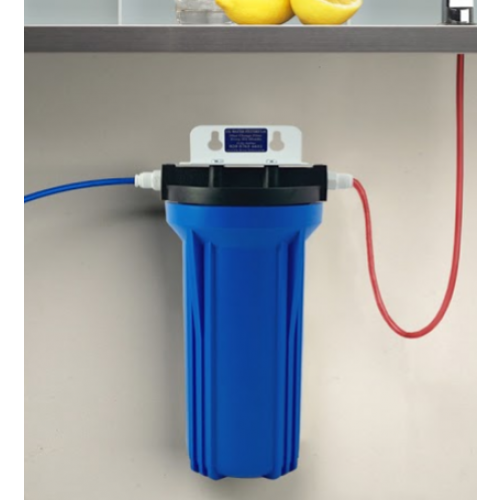 Quick and easy installation: You could be drinking beautiful, fresh, purified water within 5 minutes of receiving your kit. It takes us 2 minutes to set up one of these systems. Of course we've done it many times, but we're saying this to give you an idea of how easy it is. You can expect it to take you between 5 minutes to 10 minutes or so, to set it up yourself. Fit it once and use it forever! (These systems are very tough and should last you at least 20 years). Plus: Special Bonus: Order today and we'll include a Free easy-change spanner (Usual price £7.39). You get a free and friendly after sales helpline. And don't be surprised if your water tastes even better and purer than before (see performance details of our "Master Purifier"). Everything you need is in the pack. The filters are very easy to install. No plumber is necessary. Replacing will take a few minutes at most. But if you need our help, no problem; we've got friendly (and free) customer support available. 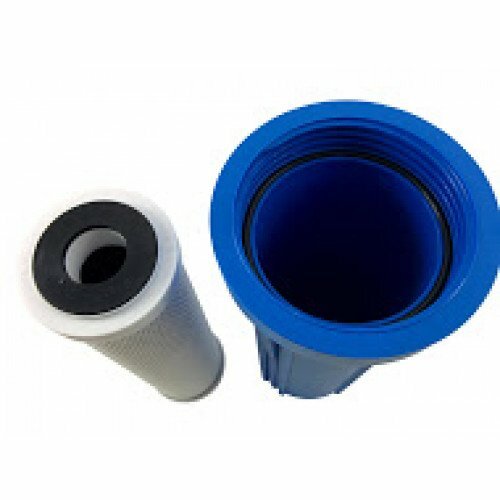 Like all water filters you will need to replace the filters on the system periodically to ensure maximum performance. You need to change the filter every 6 months. We send you a reminder. I bought this to replace an existing (and expensive) under sink filter which had been a disappointment. As I already had a tap it was just a case of swapping the housing units and anti -scale filter, which was straightforward as the existing tubing fitted. It has been an absolute success with my kettle no longer furring up, and my tea without the scum floating on the top. We live in a very hard water area, so it has certainly been tested. So glad I came across this website as I was about to give up and go back to the filter jugs most people in this area use. Excellent product for the price and easy to install would recommend. Filter arrived super promptly and I managed to fit it all by myself without any hiccups... Which is saying something coz my DIY skills aren't up to much. Very happy with purchase and customer service so will definitely be back for my replacement filters when the time comes. I used to have an in line cartridge from CDA but found them getting more expensive and harder to find. Last replacement was a similar cartridge from The Waterfilterman - it was cheaper but we found it left a metallic aftertaste. I came across your Web site when looking for other options and decided to have a try. It was very easy to fit as I already had the tap and flexible pipework. The water tastes fine so we will definately want to continue with a replacement filter in 6 months time. I'm very happy with the service and price you offer and would recommend you company to other users. I have always had quick efficient service from UK Water Filters Ltd., and will continue to use them. Excellent service all round,could not ask for anything better,carried out my order and follow up items with speed and politeness.Will carry on dealing with this company for my water filters. I am delighted with the filter housing and filter. It is obviously robust and well made. The inclusion of the tap will make changing the filter in due course easy. I must say that the manor my order was dealt with by yourselves the speed of delivery was excellent. As was the ease of fitting and working of the filter. The new Cartridge was promptly received and installed the same day. 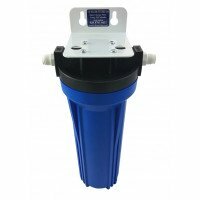 It was very easy to install as a replacement for our Astracast Springflow water filter housing and cartridge. The Springflow unit wouldn’t stop leaking after replacing the cartridge. Also Astracast did not respond to my email about a replacement housing until long after your unit had been installed. The water flow with your unit seems to be improved and also the taste. The complimentary in line isolating valve was also very easy to install and will make changing the cartridges a lot easier. The complete installation only took about 10 minutes and there were no leaks!! Thanks for the follow up and we are very pleased with your service and filter. We will be recommending you to our family and friends. This product is easy to fit and use. It works! !!. I found this company to be very helpful and they will discus and give advise over the telephone which i found very useful. Suspiciously easy to install, but working just fine! Can't fault it. It took about five minutes to put in and no complaints so far. I cannot praise your services enough. The filters and adaptors are working great. Fast delivery and service. I have had a water filter for some years supplied by a well known outfit. Although a good product the refill cartridges have become extortionate. So I got one of these and look forward to saving money over the years. Great product and water quality is excellent. I ordered the new housing unit to replace an aging one bought from another supplier. 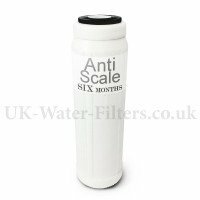 I chose UKWaterFilters as my new supplier because I have had prompt, professional and caring service in filter deliveries over a number of years. This unit upholds their tradition and culture of customer care and high product quality. Installation was simple, the unit is a space saver compared to my old one, the materials and fixtures are satisfyingly robust and precise. Just wanted to say well done for a first class service. I ordered a water purifier from you last week. The product was very good and the advice from your office very helpful. Most impressed by the rapid delivery! I will certainly use your company again and recommend you to others.